Litha and Effy are performing as part of WOW 2018 on Saturday 22nd September. Tickets available through the Kings Place website. Litha and Effy Efthymiou are London-based composers and creators, specialising in contemporary art music and large-scale interdisciplinary work. They compose individually and collaboratively and have been the recipients of awards from Arts Council England, The Wellcome Trust, PRS Women Make Music and the National Lottery. Their catalogue of music consists of contemporary art music, music for theatre and dance, and music for multidisciplinary performance. Litha and Effy’s music will be performed at the Women of the World concert series at Kings Place on 20th Oct 2018. The concert will feature new viola solos and violin duos by Litha and Effy, and Effy’s new chamber piece, commissioned by the Zeitgeist Chamber Orchestra, exploring the relationship between early Baroque music and Miles Davis’s seminal album, Birth the of the Cool. With scholarships from the Leverhulme Trust, TCM Trust, the Gladys Bratton award and the Linda Hill award, Litha studied Composition with composers Stephen Montague, Andrew Poppy and Errollyn Wallen at Trinity Laban conservatoire of music and dance, where she was awarded the Director’s Prize in the prestigious Isabelle Bond Gold Medal competition. She also won the St Paul’s Sinfonia composition competition and, together with Effy Efthymiou, won the ‘Greenwich International String Quartet Composition Competition’. artists from the fields of theatre, dance and film. She has received a number of notable commissions from artists and organisations such as New Music South West, the Bristol Ensemble, recorder quintet Consortium 5, the International Guitar Foundation, percussion group Ensemble Bash, Kettle’s Yard, St Paul’s Sinfonia, the Greenwich International String Quartet Festival and many more. Litha is currently undertaking a PhD in composition, studying with prof. John Pickard at the University of Bristol, for which she has been generously funded by the European Research Council. 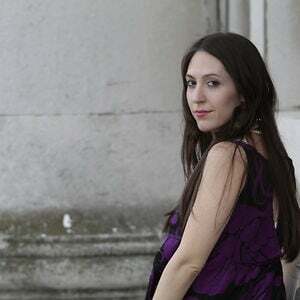 Effy Efthymiou is a British composer who works across the genres of concert music, installation, film, dance and theatre. Her works have been premiered at, among others, Royal Festival Hall, Kings Place, Sage Gateshead, National Maritime Museum, and Handel House Museum by acclaimed artists including Ensemble Bash, Jane Chapman, Wu Quartet and Consortium 5. Effy has won awards from PRS Women Make Music, Arts Council England, The Wellcome Trust, the National Lottery and The Scarman Trust to create, write the music for, produce and direct large-scale multidisciplinary projects, working with artists from the fields of theatre, dance and film. She holds a first class degree in Composition from Trinity Laban Conservatoire of Music and Dance, where she studied under Stephen Montague, Andrew Poppy and Paul Newland, with scholarships from the Leverhulme and TCM Trusts. Effy has worked with the Philharmonia Orchestra, touring the UK with leading composers and performers to conduct composition workshops in schools, prisons and youth centres.